Seacoast native and UNH graduate, Hennah was the first to join DJ Jodi Entertainment in March 2012. After several inquiries, Jodi decided to show her the ropes. Hennah proved to be as persistent in learning as she did in asking. 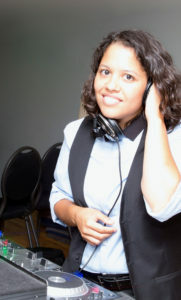 She spent hours working on mixes and shadowing DJ Jodi. Her reviews are a reflection of her hard work and dedication. Some of the biggest compliments we receive about Hennah are her great personality and awesome music selections. Hennah’s DJ style: Hip-hop, club, Top 40, latin. When she’s not DJing: Hennah is an avid record collector. She loves hiking with her wife Shelby and their two rescue pups! I am just returning to the real world after our big event and still floating from what has proved to be perhaps the best day of my life. Truly. I wanted you to know Hennah played no small part in that. She was simply fantastic and kept the dance floor hot all night long. Many people said they thought it was the best dance party they’d been to in a very long time, maybe ever, and several asked how we found Hennah. I sung your praises, of course, and recommended you highly, but Hennah was your best recommendation. She could not have been more professional. She had wonderfully calm, warm, upbeat demeanor, and she seemed to enjoy herself and the guests immensely, which only added to the fun. She was the perfect DJ for us, and I can’t thank you enough for recommending her. Thank you for being so good at what you do! Hennah was great! No complaints on our end at all. It was so much fun and she accommodated all the guests requests right up to the end. Kyanna was so thrilled she let her sing at the end of the night! Unfortunately I wasn’t able to touch base with her before I escaped to my camper to get ready but she did great setting up with out me! She accommodated my father wonderfully and without flaw! I will be recommending her. My mom was also very impressed with her and her excellent personal skills! I don’t have any pictures quite yet but I wouldn’t mind you using any of them as you wish! There are some on my FB page (shannon pry) if you want to look through those? People have tagged me in quite a few, or you can go through the professional ones when i get them. As a local small business owner myself I prefer to help expand other local small businesses! So anything you need myself and my whole family are here to help!